Kate Takes 5: How Johnny Depp Ruined My Night. How Johnny Depp Ruined My Night. On Sunday evening we did something as a family that I used to dream about one day doing. No, not appearing on Family Fortunes (who does that?). It was sitting on the sofa and watching a whole movie together. Not so long ago when the three kids were just a little younger than they are now I would have been happy if we all managed five minutes without having to get up to change a nappy, get a bottle, reach a toy, stop a fight...So as we all cuddled up quietly together I have to say I was pretty pleased with myself. 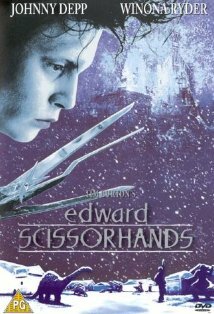 After nearly 4 weeks off school \ playschool the kids were bored with tv and their own dvds so my OH had suggested the fab 'Edward Scissorhands'. Johnny Depp for Mum, and PG rating for the kids - what could possibly go wrong? Well, nothing - initially. Even the two year old seemed transfixed with Edward - holding up his two little hands every time he saw the scissors - as if wondering why he had boring fingers when he could have had cool blades. Unbelievably we managed to watch the whole movie without incident. Even better - it finished just on bedtime - happy days! However when I turned around to tell the 6 year old, that it was time for bed she looked at me and then started wailing crying - 'But I'm scared Mummy! I don't want to go to bed'. Hmmm. At this point three things ran through my mind. 1. Am I a bad mother for not realising this would happen?, 2. Wow she is really freaking out - I should get a photo of this for the blog, 3. I am definitely a bad mother for thinking that. As I tried to calm her down the 4 year old, realised that she was getting all the attention so started copying her - only at a louder level. A couple of minutes later they were all at it. 'Look - there's nothing to be scared of.' I said. 'Edward was a nice guy. In fact he was the same guy as Captain Jack Sparrow!! And you like him don't you?' Ha - that would do it. I could see the crying easing off and the cogs turning - an amalgamation of Edward Scissorhands and Captain Jack formed in their minds. The wailing grew louder. Their Dad tried to help by doing an impersonation of him that looked a bit like a crazed robot that was coming to chop off their heads. The girl started screaming. After about an hour the house was at last quiet as they all finally fell asleep - with the lights on. That Goddamn Johnny Depp has a lot to answer for. And anyway, Johnny is just so irresistibly pretty - you won't be able to stay mad at him for long. Funny story, and one of my favourite movies--never thought of it as scary, but then there's just no telling what kids will find scary. Ana was okay with the Black Cauldron (which seems scary to ME), so we showed her Star Wars. Now she shouts 'DARTH VADER!' every time we walk by a guy wearing a hoodie (which is to say, all the time). I should have seen it coming really. Hannah - thanks as always for making me feel better about myself! Ren - what the hell are chuppacabras? MM - I bet all the hoodies think that's cool! At the moment, our four year old granddaughter insists on films where 'meanies' get soundly defeated. But think of the fun you can have in the future jumping out from behind the doors with too much face powder on and a pair of snapping scissors in your hands! You should definitely get a photo of that. Brilliant. A shame your family went through that, obviously, but it did make for a brilliant post. That was hilarious! Well, maybe not at the time, but the way you describe it, I was laughing so hard. The idea of your husband trying to make it better through impersonations only to get screams. hee hee. OH no, does it make me a bad person for laughing? Shoot. Martin - thanks for visiting - now go get those meanies! Kerry - you shouldn't be giving me ideas like that. Mid 30s - you're forgiven for laughing but only because I frequently do the same at your misfortunes. Oh God how wonderful - do you think I could do 'Despicable Me' with 19 month year olds? (DVD courtesy of Bafta - one of the perks of being a member). Had first playdate today when the girls just played nicely - without interruption, incredible - while I enjoyed coffee and baked cheese balls (courtesy of posh Brazilian cafe with play area). So maybe a film isn't so far off! Finally done my NY post. Dinner guest list to follow unless you put next list up before I get a chance! Haha...love it! I let my 6 year old watch The March of the Penguins thinking it was a perfect pre-bedtime movie. How wrong! When the baby penguin got eaten by marauding seagulls, my daughter's anguished crying was inconsolable. I tried to say they were just playing, or the newly hatched chick was just tired and was napping on the perma-frost...she wasn't fooled! Zookeeper - hang on in there - you'll be sofa bound in no time. I'm not supposed to be laughing at this post am I? We had our first family movie a few weeks back and I feel your pleasure, luckily ours was Alvin & the chipmonks so no bedtime histerics! *sniggers quietly* Sorry Kate but I had to laugh at this one. I too look forward to the days of the family movie but following this, I may have to kiss JD goodbye (if only). Ha Ha! Sorry - my goodness I bet that wasn't funny when you were in the midst of it though. Brilliant description, I can just see it all kicking off. I was thinking of the pictures you took, of your 'cross faces', to send to the Irish government, and imagining how scary your OH's robot impression must have been now I have seen his 'cross face'. I love the fact that you thought of taking a photo.Too funny!